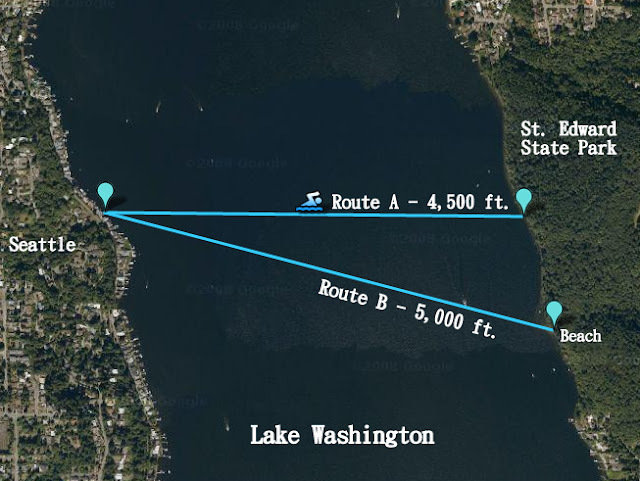 Ok, here are the swim details. 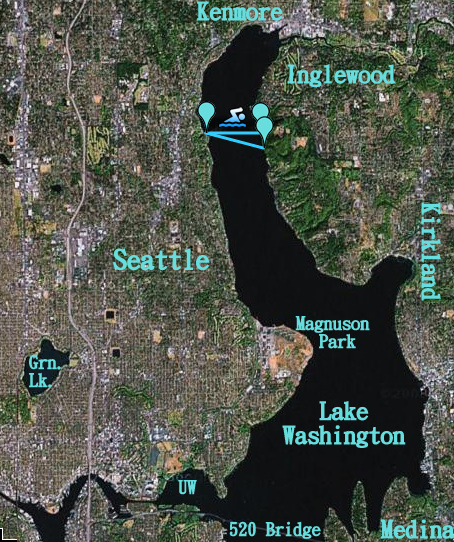 The plan was to to start from Mom and Dad's dock in Seattle and swim east, across the lake to St. Edwards State Park. Originally we were going to swim in a slight southeast direction, with our eventual destination the beach at St. Ed's. Sunday was a bit chilly (55 degrees) with a slight breeze from the south. We were to find that the resulting waves made for some interesting swimming: it was hard to get into a good rhythm, as turning your head to get a breath often resulted in a mouthful of water. Prepping. Dad had a tri suit, I had a shorty and Chris nothing but a swimsuit. He was going to be the coldest of all. Papa had rented a small trolling motor so Karin could pace us in the sailboat. The board in back was for resting, should the swimmers feel the need for a break (or were too tired to climb into the sailboat). We don't have any pictures of the actual swim, so I'll give you the written run-down: We got off to a slow start. The water was COLD and, as I mentioned earlier, it was hard to get into a rhythm. It was also intimidating to see how very far we had to swim to reach the park. One of our unanticipated problems was how difficult to swim in the right direction. Sounds simple, right? Not so much. Since you breathe to the side (and don't look straight ahead), it was easy to get going off course. This was an added complication as we were trying to stay together as a group. About halfway through I eventually worked out a breathe/look ahead combo movement that seemed to work decently well. I should have done some more research in this department. We were about 1/4 done when Mom let out a few blasts on the emergency horn. Her boat was dead in the water. We swam over and discovered that the propellor on the trolling motor had dropped off. Our rescue launch was now out of commission. Fortunately, dad had thoughtfully brought along some sheet power. Mom ran up the jibe and was able to cruise along at our approximate speed. This is not an ideal solution, given that her mobility was severly compromised and that she would be unable to come to our immediate rescue, should something go wrong. It was at this point that we decided to swim straight across to the nearest shore, rather than continuing on to the beach. The area in front of St. Ed's is a busy boat lane and we weren't willing to continue without a chase boat in the immediate vicinity. We had a bit of a tense moment when a fishing boat roared by Chris at full speed. I was further behind and wasn't able to accurately gage the distance between Chris and the boat. Frankly, it looked like it was going to run right over the top of my husband. Not a fun scene to watch. Chris later mentioned that it wasn't really close at all, but it made me particularly wary for the remainder of the swim. I kept stopping to look around for approaching boats. The end was actually uneventful: we clambered up on shore, decided it was too cold out of the water, and make a quick swim back and into the boat. From there it was a short sail back to the dock. Check it off the list!